Arise Praise and Worship Team (Grades 7 through Adults). Lutheran Church of the Resurrection’s 9:30 AM Praise and Worship service provides Contemporary Christian Music with our singers and band members. Musicians are required to know how to read music lead sheets. It is helpful for singers to be able to read music too but not necessary. There is a try‑out period for everyone. Rehearsals are Wednesdays at 6:45 PM. Adult Choir (grades 7 through adult) ‑ Our Adult Choir rehearses on Wednesdays, from 7:30 until 9:00 PM. There are no auditions for choir ‑ as long as you can sing a tune there is a place for you! We usually sing on the 2nd, 4th, and sometimes 5th Sundays of the month at the 11:00 AM service, and at special services throughout the year. Lutheran Church of the Resurrection has partnered with Advocates for the Homeless and Those in Need (AHTN) to provide a meal, once each month, to those experiencing homelessness and/or food insecurity in our community. AHTN provides transportation to the dinner, which is provided entirely by Lutheran Church of the Resurrection members. An entree is selected for each meal with members bringing additional side dishes, salad, and dessert. Lutheran Church of the Resurrection members are encouraged to participate with set up, clean up, serving and providing hospitality. Relationships are developed over the meal as we share in fellowship time with our guests. The dinners are hosted at Lutheran Church of the Resurrection on the 3rd Sunday of each month. Set up begins at 2:30 PM, with the meal being served at 4 PM. Individual members of Lutheran Church of the Resurrection have been trained and are currently working with AHTN in a variety of ways including Code Blue and Transportation for the Homeless. If you are interested in becoming a volunteer for AHTN, please see their website at AHTN.ORG. During the months of December through March, AHTN operates the Code Blue Shelter for Lower Bucks County. Any night where the wind chill is 26 degrees or less , and they have 10 shelter and 8 bus team volunteers, the shelter will open to the homeless. A hot dinner, a cot with blankets and pillows, and a continental breakfast are provided. Throughout the year, a network of over 35 houses of worship (including Lutheran Church of the Resurrection) provides meals almost every day of the year. Rejuvenation Station is a once-a-month noon meal that also includes shower facilities and a barber. AHTN provides the buses, and volunteer drivers and attendants, throughout the year, to transport guests to the daily meals, the monthly Rejuvenation, and the shelter on nights that it is open. The TIN (Those In Need) mission provides a variety of other support services, including help navigating the various county and non-profit agencies, temporary housing assistance, gas cards, small car repairs, providing bicycles, and even aiding replacing lost personal identification. They also have an 8 passenger van that can be booked in advance for transport to doctor’s appointments, welfare office visits, or court appearances – as long as volunteer drivers are available at the time needed. Lutheran Church of the Resurrection has several individuals who have been trained and volunteer with AHTN as members of the bus team or as Code Blue shelter staff. If you are interested in joining the bus team, Lutheran Church of the Resurrection’s Hank and Barbara Merritt are the AHTN Transportation Coordinators. For information about Code Blue, TIN, or any other aspect of the organization, please visit their website at AHTN.ORG. Lutheran Church of the Resurrection Youth continue to sponsor the annual Box City project which benefits the Bucks County Shelter as well as other organizations. Lutheran Church of the Resurrection also works throughout the year with the shelter through our missions committee. Interfaith Food Alliance members are working to alleviate food insecurity in our community. We recognize that together we can do much more than any one congregation can do alone. Therefore, we have partnered with other faith communities, businesses, nonprofit organizations and governments to accomplish our goals through Education, Service, and Advocacy. As our EDUCATIONAL component, the coalition of ten communities of faith who have joined forces host periodic community events surrounding the issue of food insecurity, nutrition education, and poverty. The SERVICE component is met through The Family Backpack Center, a food pantry hosted and run entirely by volunteers, which serves children in the Morrisville School District and their families, who have been identified as at risk by school nurses and guidance counselors. 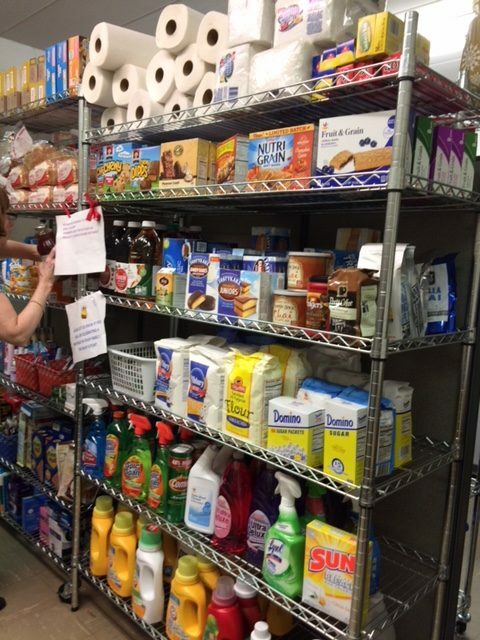 The pantry is a special place where relationships are built as the guests “shop” for the grocery items which are appealing to their families. Fresh meat, produce, dairy, bread, as well as canned goods, paper products and pantry staples are always available to the families who visit two of the four days the center is open each month. Lutheran Church of the Resurrection’s Resurrection Garden donates produce to The Family Backpack Center during the growing seasons. The ADVOCACY component is accomplished through letter writing campaigns and meetings/partnerships with our elected officials regarding the issue of food insecurity. We are the voice of those who are silenced by the shame of poverty. 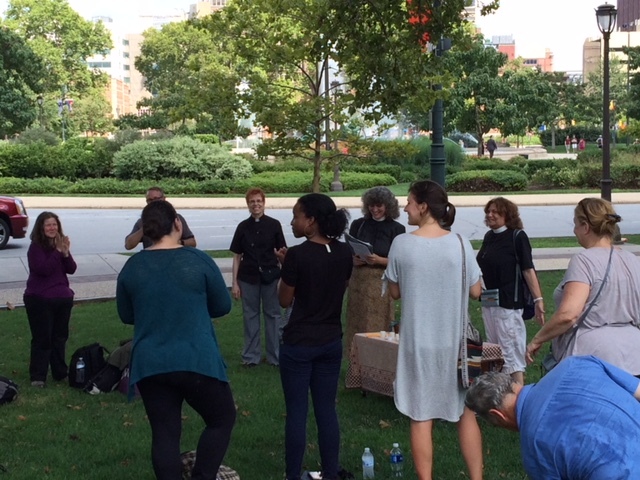 The Alliance has also partnered with The Welcome Church in Philadelphia (an ELCA congregation without walls, worshiping with those experiencing homelessness in Philadelphia), routinely hosting their coffee hour, providing coffee and snacks following services on Logan Square. Alliance members have traveled to Philadelphia to distribute blankets, coats, socks, and food to persons experiencing homelessness in the city. The Welcome Church is the worshiping community that grew out The Welcome Center, a place of healing and hospitality founded by The Reverend Violet Cucciniello Little in January of 2007 and hosted by the Lutheran Church of the Holy Communion. In January, 2012, The Welcome Church was officially recognized by the Evangelical Lutheran Church of America as a congregation under development serving people in poverty. 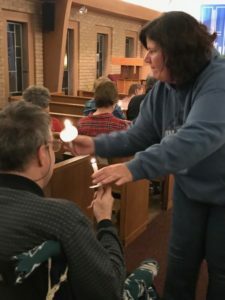 In addition to Pastors Little (ELCA) and Steinnegal (PCUSA), our volunteer clergy team includes a number of faith leaders from the Episcopal, UCC, and other traditions. All are welcome to be part of this dynamic ministry. The Disciples with Special Needs (DWSN) group was formed to reach out to special needs adults in our community. The group’s goals include: providing opportunity for fellowship and service, providing respite time for caregivers, and promoting awareness and involvement within the community. DWSN meets monthly, alternating between a social event and a service project. The group was formed in September 2006 and continues as a thriving ministry. We are always happy to welcome others to our group. Please invite special needs adults in the community and consider joining us as a chaperone. Caregivers and parents are welcome at all events, or they can drop off and pick up their disciple, enjoying a few hours of respite. 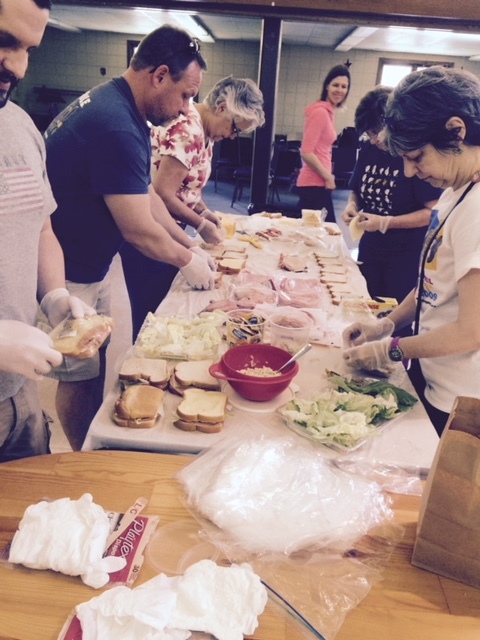 Lutheran Church of the Resurrection members prepare meals (temporary basis) for those who are recovering from surgery, sick, have just welcomed a new baby, and other special situations. This ministry helps our members and neighbors and also provides a way to serve from your own kitchen. We believe that we are blessed by God with spiritual gifts in our Baptism. Everyone has a unique combination of gifts, which we are called to use while being the hands and feet of Christ for those we meet along life’s journey. All gifts are of equal importance and all can be used to God’s glory. The Serving Hearts Ministry was created to assist all members, from the youngest to the oldest, in identifying and recognizing the spiritual gifts they possess. This is done through relationship and discernment. The ministry then assists individuals by linking them with ministry opportunities within our community. This is called asset based ministry. We recognize that everyone is better served if people are serving in ministries to which they are called, and for which they have a true passion. The Serving Hearts Ministry is here to assist you in realizing your gifts as you open your heart to serve. There are many ways to serve and many opportunities within our congregation. We are always open to new ministry opportunities and are willing to assist you get a new idea off the ground. , Serving Hearts Coordinator, to begin the conversation about how you can best use your God-given gifts to be the hands, feet, voice, ears, eyes or heart of Christ in our world. Child of God, there is a place for you here! This team provides rides for people who are unable to drive. Rides are provided to the hospital, doctors office, grocery store or wherever needed. The Faith Accompaniment Ministry was formed as a way for people to come together to interact with others who will ask the question “How are you?” and really want to hear how you REALLY are. You might be involved in caregiving due to chronic illness, aging parents or disability challenges. Some have experienced grief from loss of loved ones, pets, family breakups, financial stress, or anxiety disorders. There are those feeling financial difficulties due to loss of jobs, jobs that pay minimum wage, or families with parents taking on multiple jobs due to financial strains. These are painful situations. It’s the questions that we ask in those difficult moments that are important– How do I get through this? Have you ever hoped for someone to walk alongside you and talk with you through a life-changing event, listening to your story and assuring you that you are not alone? Accompaniment calls us to help one another when there is a need. “Merciful Monday” is a spinoff of this ministry. Did you know that Monday nights are “Support and Care” nights at Lutheran Church of the Resurrection in the Library? Each Monday, 7:00-8:30 PM, we discuss a different life topic close to our hearts or share anything in this private closed setting. Please read Resurrection Connections for dates and the topic to be discussed. Don’t feel that you have to stay on topic. We always get sidelined and no one cares. It’s what you need to talk about that is always more important. Please bring your friend who might need to share their story. We provide ongoing support to our senior members including help with medical issues and potential moves to assisted living facilities. The Sonshiners is a group of retired people who meet monthly to enjoy a Pot Luck Lunch followed by a program that involves a speaker or an activity of some kind that usually pertains to the season. Throughout the year our monthly activities also include trips to interesting local attractions such as museums, theater matinees, or historic sites. Each month the responsibility of planning the activity is taken on by a different person or group of people. Although this is listed as a “Senior Ministry,” there is no age discrimination and we welcome others to join us in these activities. We invite anyone, young or old, who enjoys good food, fun and fellowship to come and participate in our friendly group! Pickering Manor Nursing Home – Although primarily a social group, the Sonshiners also provide outreach to the community. Every third Wednesday of the month, we conduct a worship service for the residents of Pickering Manor Nursing Home in Newtown, Pennsylvania. Worship is led by the Pastor or Clyde Beury and some of our Sonshiners come along to assist with the service and chat with the residents. This is a very rewarding ministry enjoyed by the residents and also those of us who volunteer. Care Cards – Another facet of our ministry is providing the weekly Care Cards found in our Narthex each Sunday that are sent to members, friends or relatives of our church in need of some cheer. These include get well, sympathy, birth, marriage congratulations, or whatever is requested. The cost of the cards is covered by the free-will offerings that are given at our Pot Luck lunches. Children begin in worship every week. They are dismissed after the children’s message to Fellowship Hall for interactive Christian Education, including crafts, story time, music, games, and service projects. One Sunday of each month (typically the third Sunday) is designated as Children’s Worship when our children remain in the 9:30 AM worship service as leaders. Families With Young Children – Meets a few times a year and is for young children (birth through second grade) and their parents. This group provides fun events for the whole family and support and networking for fellow parents and caregivers. For more information contact Elise Rothmund. Junior & Senior High Youth Group – Meets periodically throughout the school year, providing opportunities for fellowship, learning, service, and participation in synod youth events. This is open to anyone in grades 6-12. Box City Event – Lutheran Church of the Resurrection Youth host an annual event called Box City. It is a two-part event that teaches about homelessness in Lower Bucks County and raises awareness and funds for the local homeless shelter and Family Promise of Lower Bucks. Youth Leadership at Lutheran Church of the Resurrection – Lutheran Church of the Resurrection youth are an integral part of Christ’s ministry. Our youth are welcome to serve in all areas of ministry. Our youth serve on various ministry teams, Vacation Bible School helpers, worship leaders, and much more. Our Sunday School children, beginning at age three, assist with worship leadership once a month on the designated Sunday at the 9:30 AM worship. Southeastern Pennsylvania Synod Events – Lutheran Church of the Resurrection youth participate in annual synod youth events including: JYG (Junior High Youth Gathering), SHYG (Senior High Youth Gathering), and Helping Hands Day; a day of service to the community. Lutheran Church of the Resurrection Confirmation Ministry –This ministry is for youth in grades 8 & 9. The 2017-2018 format includes Sunday morning classes after 11 AM worship. The deacons provide class instruction. This year we are again teaming up with Bear Creek Camp for Vacation Bible School. Start your child’s summer “Step by Step” with us on June 24 through June 28. Join us for a day camp of and games, activities, crafts and learning more about God’s love. We offer a full day VBS from 9:00-3:00 for children entering kindergarten through sixth grade in the fall. A half day from 9:00-11:45 will be offered for preschool children ages three to five years. At Lutheran Church of the Resurrection we believe that stewardship is the way we utilize our gifts, skills, talents and resources to practice the way we love our neighbors as we love ourselves. Stewardship is an important Lutheran Church of the Resurrection outreach ministry which entails the education, involvement and commitment of congregational members’ time, talents and treasures. Generally, a stewardship campaign is conducted in the fall of each year and led by select members of church council. The purpose of the campaign is to increase awareness of the many active ministries and opportunities for involvement and service in the church. The status of the church budget and finances is briefly discussed with an appeal for financial giving and commitment of offerings for the coming year. Typically, Bible based temple talks are made at the beginning of Sunday services during the campaign. In certain years the stewardship campaign may include household calls and home visits to check on members, increase fellowship, identify specific pastoral needs and update the church directory. The stewardship campaign emphasizes that the Lutheran Church of the Resurrection family and outreach extends beyond the church building. The campaign usually culminates in late fall on a designated “Commitment Sunday” when separate commitment cards are collected for time and talent involvement and for confidential monetary contributions for the coming year. Lutheran Church of the Resurrection strives to maximize the percentage of forecasted income for the coming year on the financial commitments made during the stewardship campaign. 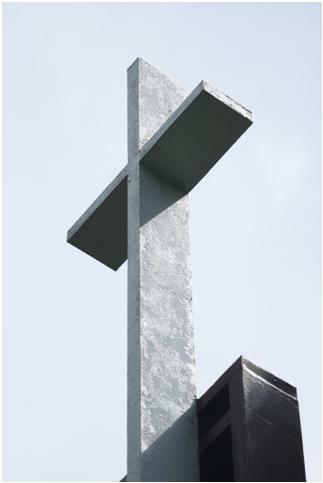 The care and maintenance of Lutheran Church of the Resurrection property is the responsibility of the Property Committee. It involves upkeep of both external and internal areas of the church on an ongoing basis as well as planning and carrying out select projects and repairs. Lutheran Church of the Resurrection members are asked to join in completing many property activities and small projects as an opportunity for fellowship and service. Spring and fall cleanups occur each year. Gardens are planted and maintained, bushes and trees are trimmed, and the parking lot is paved and painted. Inside the church many property duties are conducted including painting, light bulb replacement, carpet cleaning, minor plumbing, refinishing of furnishings and routine checking on the air conditioning and heating systems. Larger projects and services such as lawn mowing, snow removal, roof and gutter repairs, and mechanical system adjustments, are contracted by the Property Committee. The Property Committee operates within a set annual budget established by church council. The Lutheran Church of the Resurrection property is a source of pride for all members and in certain instances endowments are used to undertake select upgrades.